This is a review of the Razer Naga Chroma gaming mouse, although I will try to use this review as a broader example of what you may want (or not want) in a gaming mouse. This mouse has 12 side buttons and is designed for MMO gaming. However, I would not underestimate its abilities for professional apps (with all of those side buttons) as well as improving Windows usage in general. Unfortunately, there aren’t many productivity mice out there and the gaming market dominates mid-range mice, but this can definitely be used as a mouse for content creation, programming and other activities. 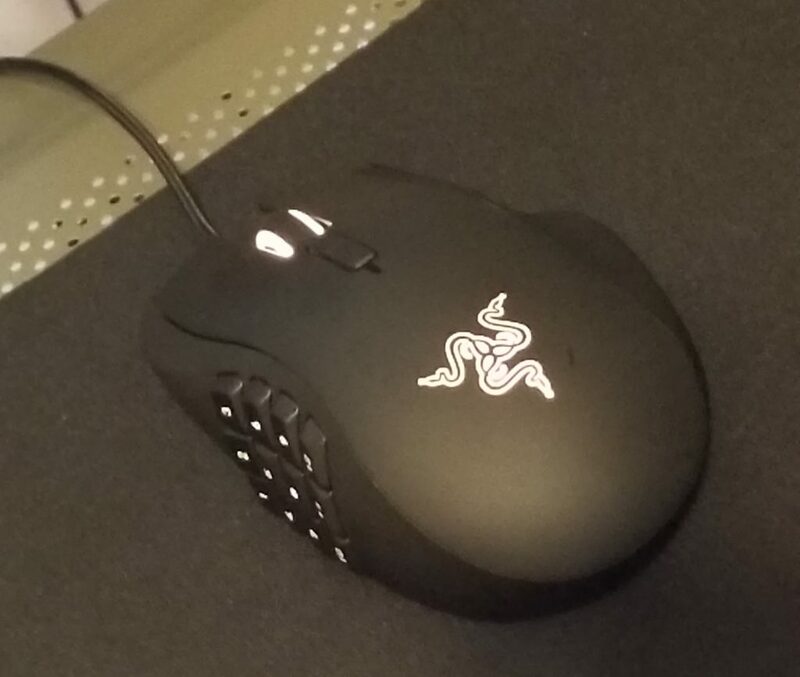 This is a medium to large mouse with a claw grip. With a claw grip, your hand is supported but your wrist is not (enabling more wrist movement for precision). It may be too large for those with small hands, but should be fine otherwise. On the right side, there is a small rest for the ring finger and a rubber grip for the pink behind it for good grip. This mouse is for right-handed people, of course. The buttons on the left require enough effort to where they mostly can only be pressed with intent, though they are not difficult to press. The mouse weighs on the light side for a big mouse, but is heavier than a small mouse; this aspect is perfect overall. Being used to a small fingertip grip mouse, it took me no longer than a day to adjust to this mouse. The build quality is not perfect, but overall positive. The scroll wheel is smooth and tactile overall. The buttons are firm and crisp but responsive and not too difficult to push. The wire is of an acceptably long length and of braided fabric (which some claim is more bend-friendly). The chassis of the mouse itself has a slightly coarse plastic material. It does not feel cheap, but its by no means luxurious. Perhaps this material was used for being less slippery. The packaging is very nice; it comes with a fancy booklet and stickers, but that’s the least important part. For MMO games with a lot of inputs, or even team-based MOBA-style games where communication inputs are useful, the buttons will be of benefit. For other games in general, it’s useful to have buttons for switching weapons. The keyboard is used for movement and other commands. At times, it is difficult to press another button to use voice chat (or another command) while using your left hand to move. Having more commands for the mouse helps distribute it evently. For action games, some of the buttons may be accidentally pressable when you grip tightly but you can always choose to not hotkey those buttons. It should be fine for all but the most competitive action gamers. Will this mouse help you win games? If you have a mouse with a low (125 Hz) poll rate, <1000 DPI and a wireless dongle/bluetooth connection, you’ll notice less lag and interruptions, then yes, this will certainly help. But ~97-99% of it will still come down to player skill. I use these commands for Windows 10 and general browsing. Copy/Paste, Volume Up/Down, switching apps, etc. There’s so many keys and commands that can be used. Being able to select different profiles is useful for when you want to switch from Windows, to a game, to a DAW like FL Studio. The software suite Synapse does require a download and login. However, it is quite robust. As stated above, setting profiles and commands is simple. While RGB isn’t exactly a priority for me, I do like how the colors, color brightness and color animation pattern are all adjustable for each the side buttons, scroll wheel and logo separately. Professional users who find the aesthetic to be tacky can always disable the lighting for the logo and tone down the brightness for the scroll wheel. The user can also adjust the liftoff distance and other settings. This is the DPI adjuster. 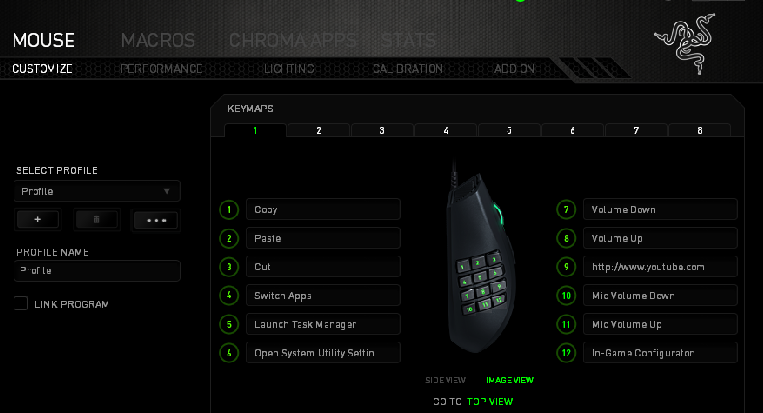 The DPI buttons are used to cycle the DPI between 5 different settings (which you can adjust). If you don’t care much about adjusting the DPI at all, you can map those two buttons for other commands. This mouse allows for 16000 DPI, which is extremely excessive. Beyond 4000, I’ve seen little benefit for more. But higher DPI will be good for 4K (and higher) resolution monitors. Price is the biggest factor with this mouse and other gaming mice from companies like Razer (or Logitech). Naga Chrome is definitely a very good mouse, and I’m sure many mice from reputable companies with same features are also very good. However, this mouse’s retail price is around $80, and that is way overpriced for what it offers. Is this twice as good (from a bang for buck perspective) compared to a $40 gaming mouse? I highly doubt it. At that price range, I would expect optional wireless functionality (which exists in their $125+ Epic version of the mouse) and premium (not just good) build quality. At least 1/3 of the price you pay here is for Razer’s marketing, advertisements, and fancy RGB lights, which I don’t care much about. I was able to buy this mouse on sale for $40 and found it to be a great deal (so be sure to shop around and look for deals). I would recommend this mouse (and mice like it) if they could be found for under $50.